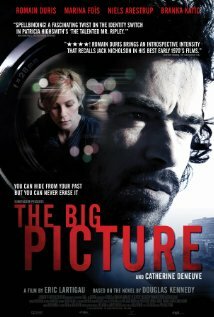 Adapted from Douglas Kennedy's international bestseller, The Big Picture stars Romain Duris, Niels Arestrup, Marina Fois and Catherine Deneuve. Paul Exben is a success story - partner in one of Paris's most exclusive law firms, big salary, big house, glamorous wife and two sons straight out of a Gap catalogue. But when he finds out that Sarah, his wife, is cheating on him with Greg Kremer, a local photographer, a rush of blood provokes Paul into a fatal error. Standing over the corpse of his wife's lover, Paul knows that his perfect life has gone for good. But by assuming the dead man's identity and fleeing for an isolated part of former Yugoslavia on the beautiful Adriatic coast, Paul gets another shot at being himself and, at last, seeing the big picture.